I recently sold a sefer Torah to a shul who brought it to my attention that the word gachon is supposed to have a big vov. I spoke to the sofer and he gave me a list of the accepted big and small letters in the torah, which I have attached to this post. Gachon is not one of them. Can anyone tell me the background info about this vov and if it is commonly written large today or not? I am quite sure that there is a mistake in this list, in all the chumashim and sifre tora the word gachon has a big vav. of the Torah. However this is difficult to calculate as the exact number of letters in a Torah has changed over time and even the Talmud reports dicrepancies between the Temple Sifrey Torah which had to be reconciled by agreement. 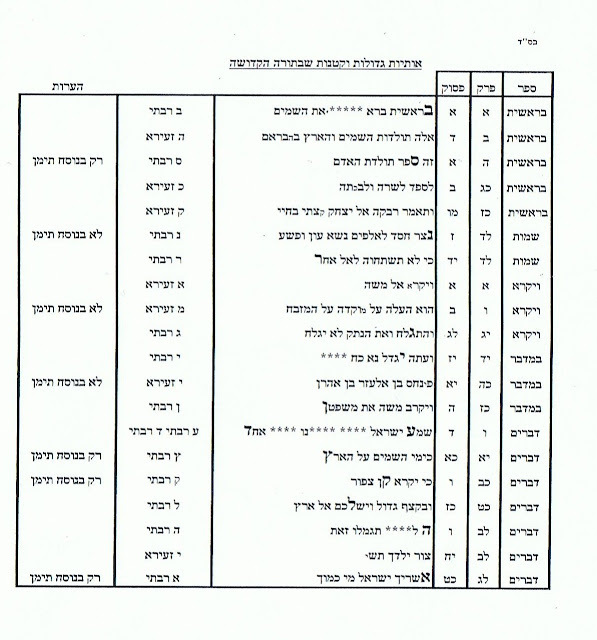 Kashrut is discussed in this section - i.e. matters which concern our bellies! However in all likelihood the vav in gachon is the middle large letter of the agreed large letters (ie the middle visual midrash). There is more on this on my website http://www.sofer.co.uk/html/large_letters.html and http://www.sofer.co.uk/html/large_secret.html in terms of universally agreed and other large letters in the Torah that scribes have a custom to do. It is even large in Yemenite Sifrey Torah which do vary in their visual midrash. The source for the large Vav of Gachon is clear. The Gemara in Kiddushin 30a establishes that the letter Vav of the word 'Gachon' is the middle letter of the Torah. 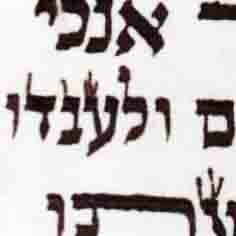 The Beraita in Sofrim (9:2) states that for this reason the Vav of 'Gachon' is written larger than normal size -- to denote that it marks a unique position in the Sefer Torah. The text of the Gemara reads as follows: The Early Torah sages were called Sofrim (those who count) because they were able to count all the letters of the Torah. They used to say, "The letter Vav of the word 'Gachon' (Parshat Shemini, VaYikra 11:42) is the half-way point of the Sefer Torah . 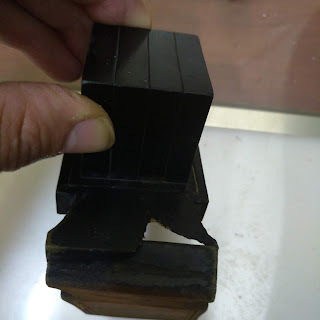 . . "
“…Rav Yosef asked, "Is the Vav of 'Gachon' the last letter of the first half of the Torah, or the first of the second half?" Abaye answered him, "Let us bring a Sefer Torah and count the letters, to find out! Did not Rabbah bar bar Chanah say that when a similar question was raised in the past, the sages did not move from there until they brought a Sefer Torah and counted?" Rav Yosef replied, "Those sages were experts in Chaserot VeYeterot while we are not experts in this matter. (Thus, our counting will not be reliable in determining the central letter of the Sefer Torah.)" There is a great difficulty which arises when one actually counts the letters of the Torah. According to our modern count, there are 304,805 letters in the Torah. The Vav of 'Gachon' is not located at the center point (letter 152,403). Instead, it is nearly 5,000 letters later, at letter #157,336! Admittedly, Rav Yosef said that we are not expert at determining Chaserot VeYeterot. According to one explanation of this view, what Rav Yosef is then saying is that in the original Sifrei Torah (without the Em HaKeriya) the Vav of Gachon would have been the middle letter of the Torah. However, because we are not experts of Chaserot VeYeterot, we are not able to distinguish one from the other. This as well appears to be the position of the Alter Rebbe, R. Shneur Zalman of Liadi: "To count the letters one must identify every vowel that lacks a supplementary letter and add that letter to the word." (for example, an Alef or Heh after every Patach or Kamatz). The above, however, just seems a bit too bizarre to consider for if Em HaKeriya where added to the first half, they were also added to the second half. As such, they should have closely balanced-out. A difference of 5,000 appears to be a bit too extreme. Likewise, interpreting Chaserot VeYeterot as plain "extra or missing letters" is also rather improbable; for even when all of the known Masorot for writing Torah scrolls, from all the various Jewish congregations around the world, are taken into consideration, there are still only 9 inconsistencies in spelling. Clearly, the missing 5,000 letters cannot be attributed to the incorrect spelling of words. Like the above, there are many other explanations attempted by commentators to explain this apparent dilemma. However, when subjected to deeper scrutiny, they all seem to be marred by confusion. The only and more logical explanation is that of R. Zilber ("Shma'atsin" vol. 43). The Vav of Gachon is the middle of all the Large & Small letters of the Torah. If one where to count them, and there are various lists, it is always in the middle. The superiority of R. Zilber's explanation is also demonstrated because it is able to confirm the other examples cited by the Gemara as well. Darosh-Darash is the middle of the double words. The Ayin of Ya'ar is the middle (of the large and small letters) of the book of Tehillim, etc... Hope that this helps. 1. Piskei Eliyahu: Refers to the list of words written with or without the extra letters Yud or Vav. In this list the Vav of “Gachon” is in the middle of the list (assumed the word “Gachon” itself should have been written without the Vav). 2. Rabbi Yiztchak Yosef Zilber: “Gachon” is not the middle letter of the entire Torah, but the middle word that contains unusual letters (words containing either a large letter or a small letters). 3. Mikra Vehamesora: The numerical difference results from historical changes of usage of Ksav Ashuris, Ksav Ivri and Aramaic, or a combination of the written letters combined with the blank spaces. 4. Symmetrically Designed Sifrei Torah (Epstein, Dickman & Wilamowsky): A different designed Torah scroll to reflect many other factors (rollers, letter placement on top, script, blank spaces, height equals circumference): a 134-page Sefer Torah with a single roller (Etz Chaim) at the front where the first 127 pages have 46 verses, the 128th page has 3 verses and the final six pages are blank. 5. Zohar Chadash: States there are 600,000 letters in the Sefer Torah (corresponding to the 600,000 Jewish souls; the name Yisrael is an acronym for the words “Yesh Shishim Ribo Otiyot LaTorah” “there is 60 ten-thousand of letters in the Torah). The method of counting is according to the number of letters that comprise the name of that letter when spelled out in full (example: letter Alef is really three letters Alef-Lamed-Feh). 6. Rav Shneur Zalman of Liadi: To count the letters one must identify every vowel that lacks a supplementary letter and add that letter to the word (for example, an Alef or Heh after every Patach or Kamatz). 7. 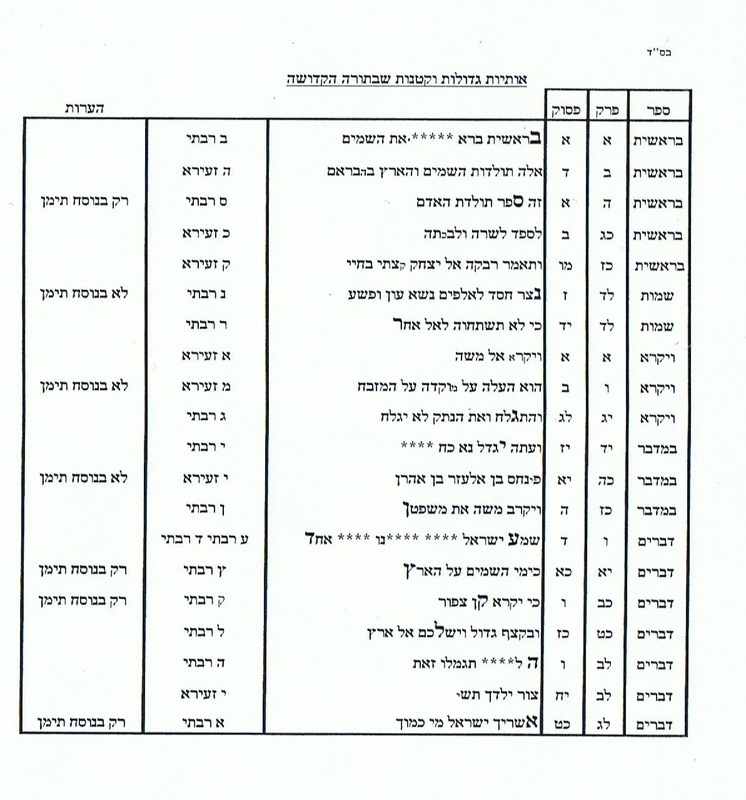 Rav Yaakov Kaminetzky: The letters of the Torah have different widths. Yud is the smallest letter width. Thus, if you count the letters according the standard width of a Yud, another count would result. (One Yud-width letters: Vav, Zayin, Yud and final Nun; One-and-a-half Yud-width letters: Gimel and Nun; Fifteen letters are two Yud-width letters; Five letters are two-plus-a-bit Yud-width letters; and one letter is three-plus-a-bit Yud-width letter. 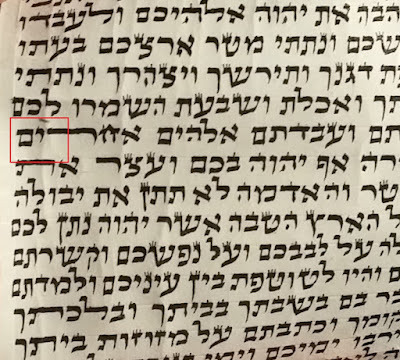 if the sofer wrote the word gachon with a regular size vav, the sefer is still kosher, correct? yes. but it is easy to fix, just add dyo to enlarge it. @alberto - great piece. I would like to repost it in my blog, with your permission.